The event brought together the four prosecutors for our region. 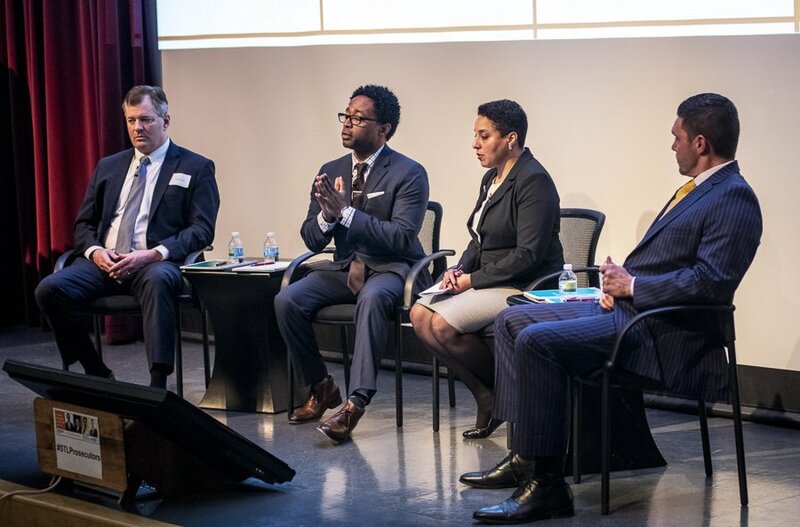 Gardner, Wesley Bell, the Prosecuting Attorney for St. Louis County, Tim Lohmar, Prosecuting Attorney for St. Charles County, and Jeff Jensen, the U.S. District Attorney for the Eastern District of Missouri. Jensen oversees the prosecutors in this area and is the top-ranking federal law enforcement official in this district. They sat opposite an engaged audience in the Missouri History Museum’s theater. The conversation was moderated by Wally Siewert, Director of Civic Engagement & FOCUS Impact Fellows at FOCUS St. Louis, who began the evening by validating both “the historical and ongoing legacy of profound self-sacrifice by individuals who serve in the criminal justice institutions” and “the historical and ongoing legacy of deeply unjust racial disparities in the use of violent government force by the individuals and institutions of criminal justice” and asked both panelists and prosecutors to keep both truths in mind. From that framework, Siewert asked the assembled prosecutors to speak on how they how they hope their offices look in 2039 (in terms of being racially just) and what steps they are open to taking now to get their offices to that place. Their answers were similar. Bell, Gardner, and Lohmar all spoke of working to increase diversionary and treatment programs. “We have to start addressing the root causes of not only crime, but also social economic disparities, and much of it relates back to poverty. When you look at how the justice system works for those with means, as opposed to those without means, there’s a clear dichotomy,” said Bell. “Unless we’ve given them tools to equip themselves to be more productive citizens, they’re going to go right back into the cycle of criminal activity,” Lohmar concurred. “We can’t just be in our silos. We have to look at diversion programs, we have to look at drug treatment and mental health treatment programs because many of the low-level offenders turn into the violent offenders. If we don’t address that root cause we’re going to be spinning our wheels and fighting that same war over and over,” Bell explained. In response, Bell’s office is partnering with community organizations such as Affinia, Places for People, and BJC to expand their diversionary and treatment programs. “If we start addressing these issues, get ahead of the curve, then we’ll be a destination city again,” Bell predicted. One particularly bright spot in the discussion was news of how well the Eastern District of Missouri does with rehabilitation for federal offenders. 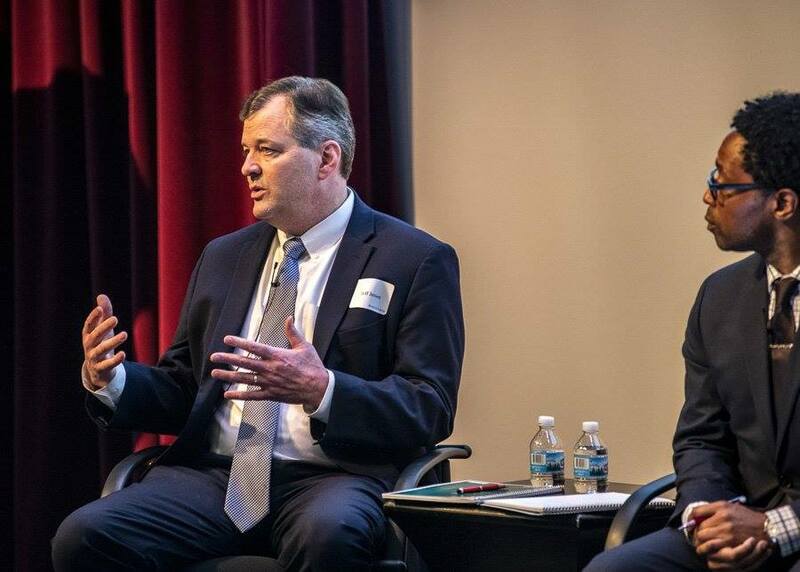 Jeff Jensen, the U.S. District Attorney for the Eastern District of Missouri at the History Museum during FOCUS St. Louis’ #STLProsecutors event. “That is how you make inter-generational change,” Jensen said. Photos by Chuck Ramsay. Learn more about his work on his website.